Remind me again why you go to work in the morning? Is it because you are so committed to the mission of your corporate employer that you would willingly work for nothing if they asked you to? Does your job provide you with so high a degree of life-meaning and personal satisfaction that you would gladly do it in exchange for the minimum income required to feed and clothe yourself? For almost all of us, work is a means of obtaining money; and money is merely the means by which we are able to consume the goods and services we desire. Now let me ask you a multiple choice question: why do you think that the oceans are currently so full of plastic that it has polluted the entire marine food chain? Is it (a) because evil petrochemical companies simply dump plastic into the sea; or is it (b) because it is the inevitable product of mass consumption by 7.5 billion humans (especially those of us in developed states)? Plastic pollution, along with all of the other fallouts from the globalised industrial economy, is the end consequence of our collective consumption of the goods and services that we desire. The various versions of green new dealism that have hit the headlines recently have no alternative but to avoid both of these questions. Instead, they reduce a human impact crisis – aka “the Anthropocene” or “the overshoot” crisis – to the single dimension of greenhouse gas emissions. They then reduce the greenhouse gas emission crisis to a carbon dioxide crisis; which is further reduced to only the carbon dioxide emitted in the course of electricity generation. Murray argues that any attempt to implement the green new deal is likely to be closer to the Moon shot than the war. Nevertheless, we are still talking about billions of dollars and millions of new construction jobs. For Murray, the key economic problem here is that wind turbines and solar panels require very little labour to operate and maintain. As a result, any jobs created would necessarily be temporary. This, however is a secondary concern and is easily counter-critiqued by the proponents of green new dealism – the additional demand created in the wider economy by the new deal workers spending their wages will create a wider economic boom that will generate new jobs to employ these workers as the construction phase comes to an end. Let us now revisit those awkward questions I posed at the beginning of this post. What proportion of several millions of green new deal workers will be offering their labour for free? What proportion will work in exchange for meals, clothing and a bed for the night? Most will expect to be paid at least the minimum wage. And if the promises of the green new dealers are to be realised, a large proportion of the jobs created will need to be high-skilled and high-paid. Most workers do not simply save their wages every month. Indeed, one of economist John Maynard Keynes’ observations which informed the original new dealism in the 1930s was that ordinary workers had a far greater propensity to spend than wealthier people. That is, if someone who is currently only able to eat because of food stamps or a package from a foodbank is given a job at the current average wage – $56,500 (US) £28,600 (UK) – they are likely to spend almost all of it; whereas if the same average wage were given to the CEO of an international bank, they would be far more likely to save it. So, from a demand point of view, creating lots of relatively well-paid jobs for people who are currently unemployed, underemployed or eking out a living on the minimum wage makes absolute economic sense. Environmentally, not so much. The technologies that the new jobs are created to deploy are intended to be greener than the technologies they replace – although they still necessarily involve fossil fuels in their manufacture, transportation, deployment and maintenance. Nor – at least for now – are these technologies recyclable; indeed, solar panels contain toxic chemicals that prevent either recycling or landfill disposal. And, of course, in the absence of seasonal grid-scale storage technologies nuclear baseload and gas stand-by capacity will continue to be needed to smooth out intermittency. These, though, are again secondary problems. The main issue that any green new deal has to overcome if it is to have any credibility is how we go about preventing millions of new workers from actually spending their additional income. For all of its many flaws, one of the environmental benefits of quantitative easing since 2008 is that very little of the newly printed currency has seeped out into the real economy. Most has been used for corporate share buy-backs or investment in various derivatives that do little to increase demand for goods and services across the real economy. Indeed, this is one of the central criticisms of the current policies levelled by green new dealers. Any green new deal, in contrast would be increasing global consumption of goods and services by billions – if not trillions – of dollars worldwide. But mass consumption is precisely the cause of our environmental crisis in the first place. Millions of new wage labourers are no less likely to purchase such things as single-use plastic containers, corn-fed beef, petrol cars and international travel than any of the current workforce. The result is that as fast as the electricity generating industry is curbing carbon dioxide emissions, the manufacturing, transportation and industrialised agriculture sectors will be ramping up their emissions – and using up the planet’s remaining resources – to satisfy the new demand. Far from being a means of sustaining a global economy built upon fossil fuels, a green new deal that creates new jobs and stimulates economic growth amounts to little more than a final blow-out binge before our once-and-done global economy comes crashing down around our ears. The only means – assuming any is possible at this late stage – of mitigating the environmental catastrophe that is gathering pace around us is to engage in a managed process of de-growth (which may include some deployment of non-renewable renewable energy-harvesting technologies) to create far smaller, localised and less consumptive economies than we have had for many decades. By necessity, the process would also require a shrinking of the human population to a level in accordance both with what is sustainable and with the standard of living we consider acceptable – i.e., the more consumptive our lifestyles, the lower our life expectancy/birth rate will have to be. This is not, of course, anything that is going to win votes at an election. But any detailed examination of the environmental impact of millions of new workers spending their new wages on even more of the same patterns of consumption that have already brought our planet to the edge of extinction should – in any sane world – be no less acceptable. It is a tribute to our propensity for denial that so many people regard green new dealism as an environmental good rather than the catastrophe it is likely to become. Is peak everything just around the corner? What Happened in 2015 that Changed the World? Peak Civilization, Maybe? 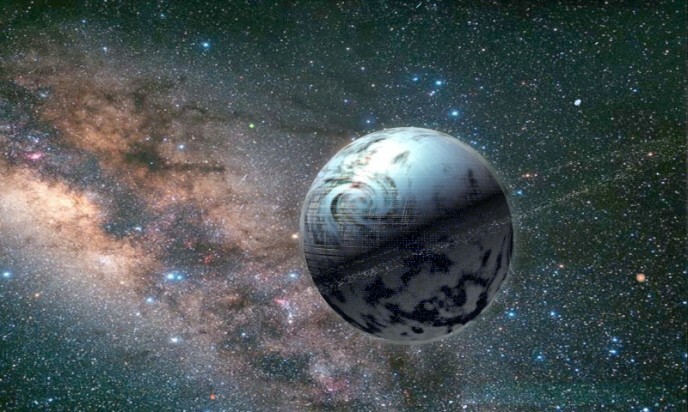 “Peak Cement” may have taken place in 2015, stopping the exponentially growing curve that would have led us to turn the Earth into a bowling ball, similar to the fictional planet Trantor, Galactic capital in Isaac Asimov’s series “Foundation” (image source). Impressive, right? Steve Rocco, smart as usual, had already noticed this trend in 2017, but now it is clearer. It looks like a peak, it has the shape of a peak, it gives the impression of a peak. 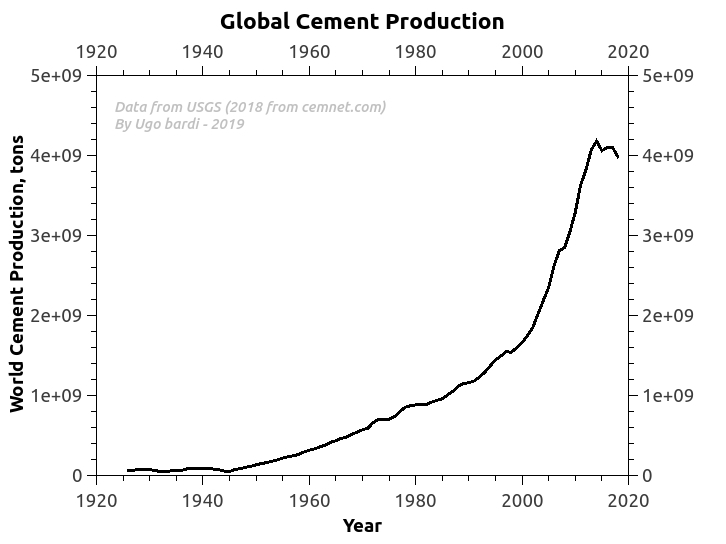 Most likely it is a peak — actually, it could be the start of an irreversible decline in the global cement production. Now, what caused the decline? If you look at the disaggregated data, it is clear that the slowdown was mainly created by China, but not just by China. 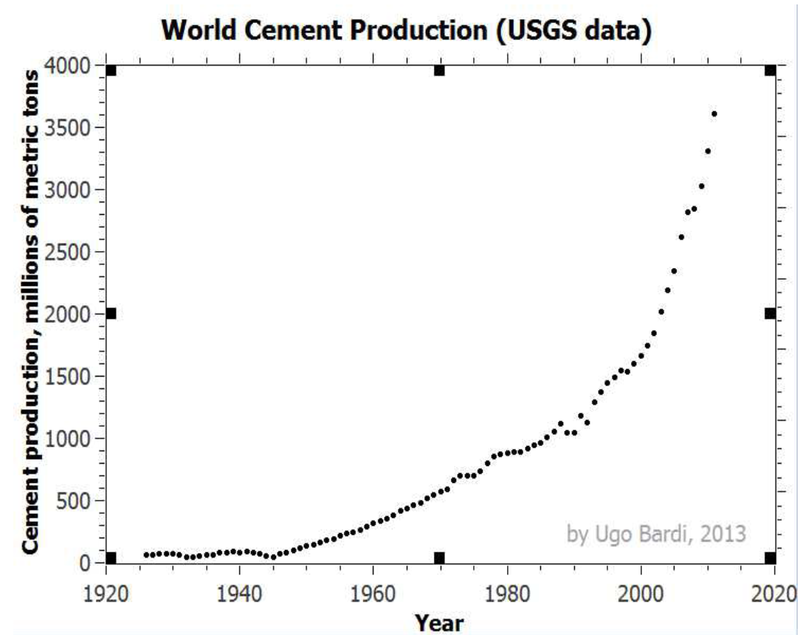 Several countries in the world are going down in terms of cement production — in Italy, the decline started in 2010. My impression — that I share with the one proposed by Rocco — is that this is not a blip in the curve, nor a special case among the various mineral commodities produced nowadays. It is a symptom of a general problem: it may be the clearest manifestation of the concept of “peak civilization” that the 1972 “Limits to Growth” study had placed for some moment during the 1st or 2nd decades of the 21st century. 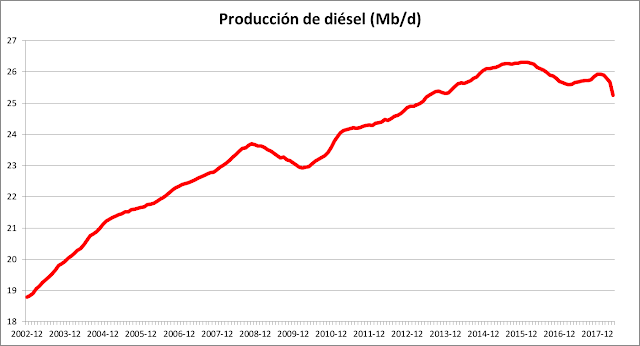 Peak Cement is not alone another major peak was detected by Antonio Turiel for diesel fuel in 2015. So, are we really facing “peak civilization”? It is hard to say. On a time scale of a few years, many things could change and, in any case, you don’t expect peaking to take place at the same time for all mineral commodities, everywhere. A strong indication that the whole world system is peaking would come from the behavior of the global GDP. Rocco had proposed that also the GDP had peaked in 2015, but the data available at present are insufficient to prove that. In any case, it has been said that we would see the great peak “in the rear mirror”and this may well be what we are seeing. Whatever is happening it will be clearer in the future but, if it is really “the peak“, expect the Seneca cliff to open up in front of us in the coming years. And maybe it won’t be such a bad thing(*): did we really want to turn the Earth into a bowling ball? Another incisive self explanatory article by Gail Tverberg explaining the recent volatility and what outcomes we can expect from that this coming year (and next) MUST READ. Financial markets have been behaving in a very turbulent manner in the last couple of months. The issue, as I see it, is that the world economy is gradually changing from a growth mode to a mode of shrinkage. This is something like a ship changing course, from going in one direction to going in reverse. The system acts as if the brakes are being very forcefully applied, and reaction of the economy is to almost shake. What seems to be happening is that the world economy is reaching Limits to Growth, as predicted in the computer simulations modeled in the 1972 book, The Limits to Growth. In fact, the base model of that set of simulations indicated that peak industrial output per capita might be reached right about now. Peak food per capita might be reached about the same time. I have added a dotted line to the forecast from this model, indicating where the economy seems to be in 2019, relative to the base model. Figure 1. Base scenario from The Limits to Growth, printed using today’s graphics by Charles Hall and John Day in Revisiting Limits to Growth After Peak Oil with dotted line at 2019 added by author. The 2019 line is drawn based on where the world economy seems to be now, rather than on precisely where the base model would put the year 2019. The sale of Chinese private passenger vehicles for the year of 2018 through November is down by 2.8%, with November sales off by 16.1%. Most analysts are forecasting this trend of contracting sales to continue into 2019. Lower sales seem to reflect affordability issues. Saudi Arabia plans to cut oil production by 800,000 barrels per day from the November 2018 level, to try to raise oil prices. Profits are too low at current prices. Coal is reported not to have an economic future in Australia, partly because of competition from subsidized renewables and partly because China and India want to prop up the prices of coal from their own coal mines. If a person looks at history, it becomes clear that tariffs are a standard response to a problem of shrinking food or industrial output per capita. Tariffs were put in place in the 1920s in the time leading up to the Great Depression, and were investigated after the Panic of 1857, which seems to have indirectly led to the US Civil War. Whenever an economy produces less industrial or food output per capita there is an allocation problem: who gets cut off from buying output similar to the amount that they previously purchased? Tariffs are a standard way that a relatively strong economy tries to gain an advantage over weaker economies. Tariffs are intended to help the citizens of the strong economy maintain their previous quantity of goods and services, even as other economies are forced to get along with less. I see Trump’s trade policies primarily as evidence of an underlying problem, namely, the falling affordability of goods and services for a major segment of the population. Thus, Trump’s tariffs are one of the pieces of evidence that lead me to believe that the world economy is reaching Limits to Growth. 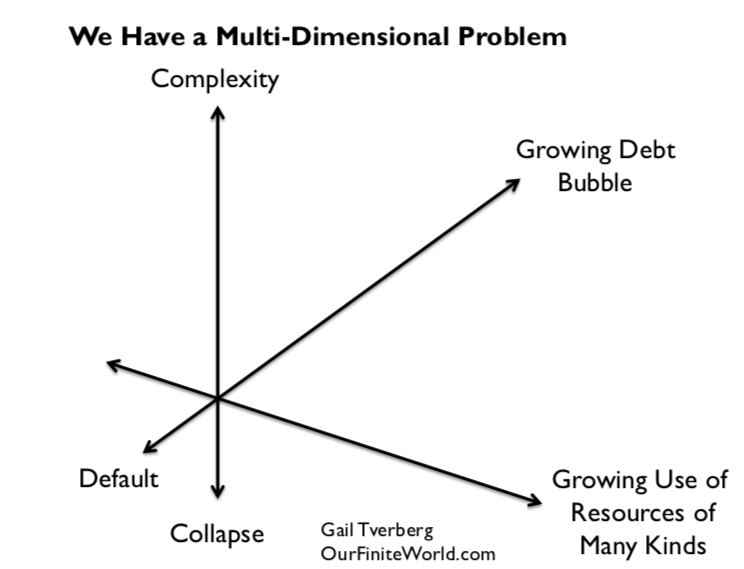 Economic growth seems to require growth in three dimensions (a) Complexity, (b) Debt Bubble, and (c) Use of Resources. Today, the world economy seems to be reaching limits in all three of these dimensions (Figure 2). Complexity involves adding more technology, more international trade and more specialization. Its downside is that it indirectly tends to reduce affordability of finished end products because of growing wage disparity; many non-elite workers have wages that are too low to afford very much of the output of the economy. As more complexity is added, wage disparity tends to increase. International wage competition makes the situation worse. A growing debt bubble can help keep commodity prices up because a rising amount of debt can indirectly provide more demand for goods and services. For example, if there is growing debt, it can be used to buy homes, cars, and vacation travel, all of which require oil and other energy consumption. If debt levels become too high, or if regulators decide to raise short-term interest rates as a method of slowing the economy, the debt bubble is in danger of collapsing. A collapsing debt bubble tends to lead to recession and falling commodity prices. Commodity prices fell dramatically in the second half of 2008. Prices now seem to be headed downward again, starting in October 2018. Figure 3. Brent oil prices with what appear to be debt bubble collapses marked. Figure 4. Three-month treasury secondary market rates compared to 10-year treasuries from FRED, with points where short term interest rates exceed long term rates marked by author with arrows. 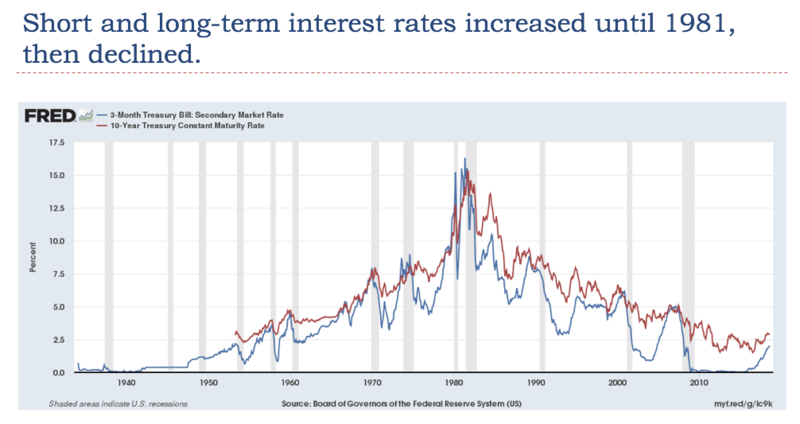 Even the relatively slow recent rise in short-term interest rates (Figure 4) seems to be producing a decrease in oil prices (Figure 3) in a way that a person might expect from a debt bubble collapse. The sale of US Quantitative Easing assets at the same time that interest rates have been rising no doubt adds to the problem of falling oil prices and volatile stock markets. The gray bars in Figure 4 indicate recessions. Growing use of resources becomes increasingly problematic for two reasons. One is population growth. As population rises, the economy needs more food to feed the growing population. This leads to the need for more complexity (irrigation, better seed, fertilizer, world trade) to feed the growing world population. The other problem with growing use of resources is diminishing returns, leading to the rising cost of extracting commodities over time. Diminishing returns occur because producers tend to extract the cheapest to extract commodities first, leaving in place the commodities requiring deeper wells or more processing. Even water has this difficulty. At times, desalination, at very high cost, is needed to obtain sufficient fresh water for a growing population. In the last section, I discussed the cost of producing commodities of many kinds rising because of diminishing returns. Higher costs should lead to higher prices, shouldn’t they? Strangely enough, higher costs translate to higher prices only sometimes. When energy consumption per capita is rising rapidly (peaks of red areas on Figure 5), rising costs do seem to translate to rising prices. Spiking oil prices were experienced several times: 1917 to 1920; 1974 to 1982; 2004 to mid 2008; and 2011 to 2014. All of these high oil prices occurred toward the end of the red peaks on Figure 5. In fact, these high oil prices (as well as other high commodity prices that tend to rise at the same time as oil prices) are likely what brought growth in energy consumption down. The prices of goods and services made with these commodities became unaffordable for lower-wage workers, indirectly decreasing the growth rate in energy products consumed. The red peaks represented periods of very rapid growth, fed by growing supplies of very cheap energy: coal and hydroelectricity in the Electrification and Early Mechanization period, oil in the Postwar Boom, and coal in the China period. With low energy prices, many countries were able to expand their economies simultaneously, keeping demand high. The Postwar Boom also reflected the addition of many women to the labor force, increasing the ability of families to afford second cars and nicer homes. 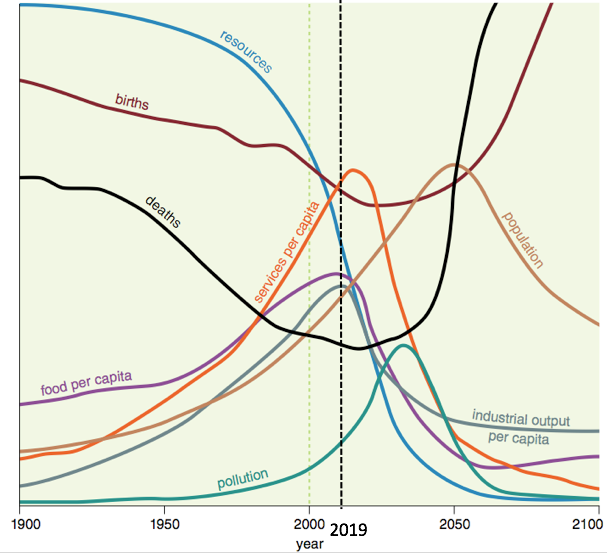 Rapidly growing energy consumption allowed per capita output of both food (with meat protein given a higher count than carbohydrates) and industrial products to grow rapidly during these peaks. The reason that output of these products could grow is because the laws of physics require energy consumption for heat, transportation, refrigeration and other processes required by industrialization and farming. In these boom periods, higher energy costs were easy to pass on. 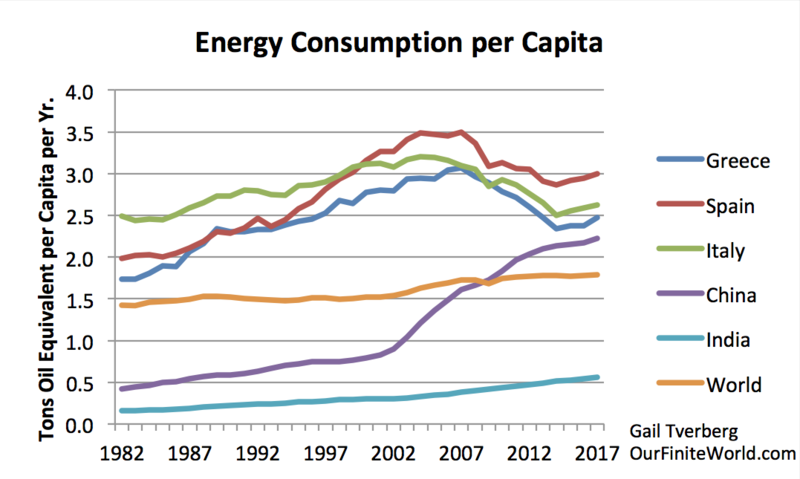 Eventually the higher energy costs “caught up with” the economy, and pushed growth in energy consumption per capita down, putting an end to the peaks. Figure 6 shows Figure 5 with the valleys labeled, instead of the peaks. When I say that the world economy is reaching “peak industrial output per capita” and “peak food per capita,” this represents the opposite of a rapidly growing economy. In fact, if the world is reaching Limits to Growth, the situation is even worse than all of the labeled valleys on Figure 6. In such a case, energy consumption growth is likely to shrink so low that even the blue area (population growth) turns negative. In such a situation, the big problem is “not enough to go around.” While cost increases due to diminishing returns could easily be passed along when growth in industrial and food output per capita were rapidly rising (the Figure 5 situation), this ability seems to disappear when the economy is near limits. Part of the problem is that the lower growth in per capita energy affects the kinds of jobs that are available. With low energy consumption growth, many of the jobs that are available are service jobs that do not pay well. Wage disparity becomes an increasing problem. When wage disparity grows, the share of low wage workers rises. If businesses try to pass along their higher costs of production, they encounter market resistance because lower wage workers cannot afford the finished goods made with high cost energy products. For example, auto and iPhone sales in China decline. The lack of Chinese demand tends to lead to a drop in demand for the many commodities used in manufacturing these goods, including both energy products and metals. Because there is very little storage capacity for commodities, a small decline in demand tends to lead to quite a large decline in prices. Even a small decline in China’s demand for energy products can lead to a big decline in oil prices. Strange as it may seem, the economy ends up with low oil prices, rather than high oil prices, being the problem. Other commodity prices tend to be low as well. What Is Ahead, If We Are Reaching Economic Growth Limits? 1. Figure 1 at the top of this post seems to give an indication of what is ahead after 2019, but this forecast cannot be relied on. A major issue is that the limited model used at that time did not include the financial system or debt. Even if the model seems to provide a reasonably accurate estimate of when limits will hit, it won’t necessarily give a correct view of what the impact of limits will be on the rest of the economy, after limits hit. The authors, in fact, have said that the model should not be expected to provide reliable indications regarding how the economy will behave after limits have started to have an impact on economic output. 2. As indicated in the title of this post, considerable financial volatility can be expected in 2019if the economy is trying to slow itself. Stock prices will be erratic; interest rates will be erratic; currency relativities will tend to bounce around. The likelihood that derivatives will cause major problems for banks will rise because derivatives tend to assume more stability in values than now seems to be the case. Increasing problems with derivatives raises the risk of bank failure. 3. The world economy doesn’t necessarily fail all at once. Instead, pieces that are, in some sense, “less efficient” users of energy may shrink back. During the Great Recession of 2008-2009, the countries that seemed to be most affected were countries such as Greece, Spain, and Italy that depend on oil for a disproportionately large share of their total energy consumption. China and India, with energy mixes dominated by coal, were much less affected. Figure 7. 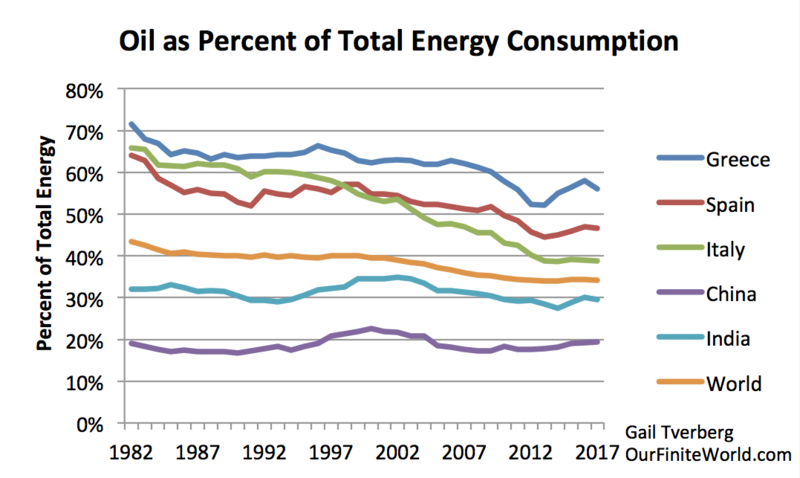 Oil consumption as a percentage of total energy consumption, based on 2018 BP Statistical Review of World Energy data. Figure 8. Energy consumption per capita for selected areas, based on energy consumption data from 2018 BP Statistical Review of World Energy and United Nations 2017 Population Estimates by Country. In the 2002-2008 period, oil prices were rising faster than prices of other fossil fuels. This tended to make countries using a high share of oil in their energy mix less competitive in the world market. The low labor costs of China and India gave these countries another advantage. By the end of 2007, China’s energy consumption per capita had risen to a point where it almost matched the (now lower) energy consumption of the European countries shown. China, with its low energy costs, seems to have “eaten the lunch” of some of its European competitors. In 2019 and the years that follow, some countries may fare at least somewhat better than others. The United States, for now, seems to be faring better than many other parts of the world. 4. While we have been depending upon China to be a leader in economic growth, China’s growth is already faltering and may turn to contraction in the near future. One reason is an energy problem: China’s coal production has fallen because many of its coal mines have been closed due to lack of profitability. As a result, China’s need for imported energy (difference between black line and top of energy production stack) has been growing rapidly. China is now the largest importer of oil, coal, and natural gas in the world. It is very vulnerable to tariffs and to lack of available supplies for import. Figure 9. 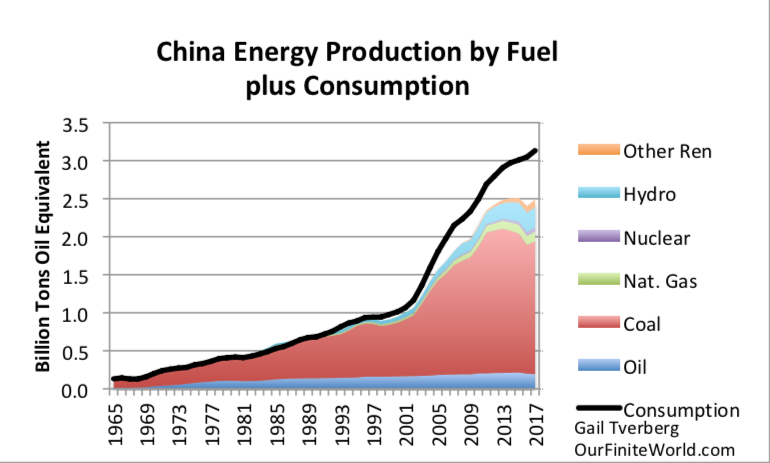 China energy production by fuel plus its total energy consumption, based on BP Statistical Review of World Energy 2018 data. A second issue is that demographics are working against China; its working-age population already seems to be shrinking. A third reason why China is vulnerable to economic difficulties is because of its growing debt level. Debt becomes difficult to repay with interest if the economy slows. 5. Oil exporters such as Venezuela, Saudi Arabia, and Nigeria have become vulnerable to government overthrow or collapse because of low world oil prices since 2014. If the central government of one or more of these exporters disappears, it is possible that the pieces of the country will struggle along, producing a lower amount of oil, as Libya has done in recent years. It is also possible that another larger country will attempt to take over the failing production of the country and secure the output for itself. 6. Epidemics become increasingly likely, especially in countries with serious financial problems, such as Yemen, Syria, and Venezuela. Historically, much of the decrease in population in countries with collapsing economies has come from epidemics. Of course, epidemics can spread across national boundaries, exporting the problems elsewhere. 7. Resource wars become increasingly likely. These can be local wars, perhaps over the availability of water. They can also be large, international wars. 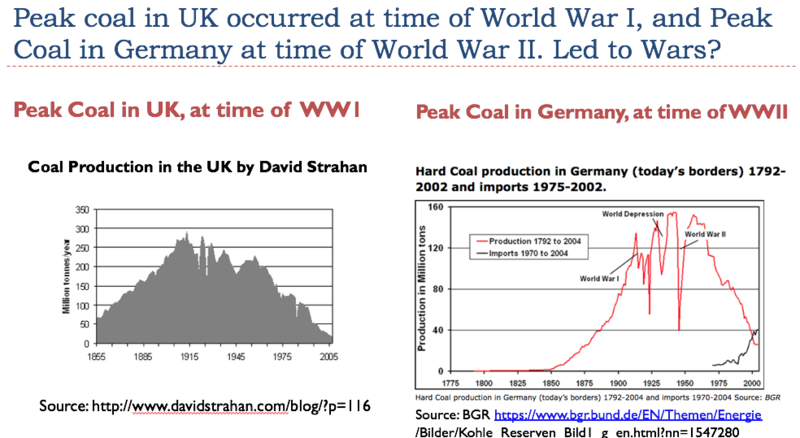 The timing of World War I and World War II make it seem likely that these wars were both resource wars. 8. Collapsing intergovernmental agencies, such as the European Union, the World Trade Organization, and the International Monetary Fund, seem likely. The United Kingdom’s planned exit from the European Union in 2019 is a step toward dissolving the European Union. 9. Privately funded pension funds will increasingly be subject to default because of continued low interest rates. Some governments may choose to cut back the amounts they provide to pensioners because governments cannot collect adequate tax revenue for this purpose. Some countries may purposely shut down parts of their governments, in an attempt to hold down government spending. 10. A far worse and more permanent recession than that of the Great Recession seems likely because of the difficulty in repaying debt with interest in a shrinking economy. It is not clear when such a recession will start. It could start later in 2019, or perhaps it may wait until 2020. As with the Great Recession, some countries will be affected more than others. Eventually, because of the interconnected nature of financial systems, all countries are likely to be drawn in. It is not entirely clear exactly what is ahead if we are reaching Limits to Growth. Perhaps that is for the best. If we cannot do anything about it, worrying about the many details of what is ahead is not the best for anyone’s mental health. While it is possible that this is an end point for the human race, this is not certain, by any means. There have been many amazing coincidences over the past 4 billion years that have allowed life to continue to evolve on this planet. More of these coincidences may be ahead. We also know that humans lived through past ice ages. They likely can live through other kinds of adversity, including worldwide economic collapse. Are Gilets Jaunes the new guillotine? Between my French origins and the opinions expressed within this little blog, I have taken more than a passing interest in the events happening in France, especially when it’s fuelled by passionate and restless wwoofers who come from there too! As you will or should know, I believe the real economy runs on energy, not money, and surplus energy in particular…… as a result, I have been following Tim Morgan’s Surplus Energy Economics blog for a while, which I would encourage you all to follow too. This is Tim’s latest gem, which proves that when you do the math……. the truth comes out! This weekend, the authorities plan to field 89,000 police officers across France in response to anticipated further mass protests by the ‘gilets jaunes’. In the capital, the Eiffel Tower will be closed and armoured cars deployed, whilst restaurateurs and shopkeepers are being urged to close their businesses at one of the most important times of their trading year. Though the government has climbed down on the original cause célèbre – the rises in fuel taxes planned for next year – there seems to be no reduction in the worst protests experienced in the country since the 1960s. Reports suggest that as many as 70% of French citizens support the protestors, and that the movement may be spreading to Belgium and the Netherlands. For the outside observer, the most striking features of the protests in France have been the anger clearly on display, and the rapid broadening of the campaign from fuel prices to a wider range of issues including wages, the cost of living and taxation. The disturbances in France should be seen in a larger context. In France itself, Emmanuel Macron was elected president only after voters had repudiated all established political parties. Italians have entrusted their government to an insurgent coalition which is on a clear collision-course with the European Union over budgetary matters. The British have voted to leave the EU, and Americans have elected to the White House a man dismissed by ‘experts’ as a “joke candidate” throughout his campaign. Obviously, something very important is going on – why? Does economics explain popular anger? There are, essentially, two different ways in which the events in France and beyond can be interpreted, and how you look at them depends a great deal on how you see the economic situation. If you subscribe to the conventional and consensus interpretation, economic issues would seem to play only a supporting role in the wave of popular unrest sweeping much of the West. You would concede that the seemingly preferential treatment of a tiny minority of the very rich has angered the majority, and that some economic tendencies – amongst them, diminishing security of employment – have helped fuel popular unrest. Beyond this, though, you would note that economies are continuing to grow, and this would force you to look for explanations outside the purely economic sphere. From this, you might conclude that ‘agitators’, from the right or left of the political spectrum, might be playing a part analogous to the role of “populist” politicians in fomenting public dissatisfaction with the status quo. If, on the other hand, you subscribe to the surplus energy interpretation of the economy professed here, your view of the situation would concentrate firmly on economic issues. Though GDP per capita may be continuing to improve, the same cannot be said of prosperity. According to SEEDS (the Surplus Energy Economics Data System), personal prosperity in France has deteriorated by 7% since 2000, a trend starkly at variance with the growth (of 12%) in reported GDP over the same period. Not only is the average French person poorer now than he or she was back in 2000, but each person’s share of the aggregate of household, business and government debt has increased by almost 70% since 2000. These findings are summarised in the following table, sourced from SEEDS. Two main factors explain the divergence between the conventional and the surplus energy interpretations of the economy. One of these is the pouring of enormous quantities of cheap debt and cheap money into the system, a process which boosts recorded GDP without improving prosperity (for the obvious reason that you can’t become more prosperous just by spending borrowed money). The other is the exponential rise in the energy cost of energy (ECoE), a process which impacts prosperity by reducing the share of output which can be used for all purposes other than the supply of energy itself. In France, and with all sums expressed in euros at constant 2017 values, GDP grew by 23% between 2000 and 2017. But this growth, whilst adding €433bn to GDP, was accompanied by a €3.07tn increase in aggregate debt. This means that each €1 of reported growth in the French economy has come at a cost of more than €7 in net new debt. Put another way, whilst French GDP is growing at between 1.5% and 2.0%, annual borrowing is running at about 9.5% of GDP. Cutting to the chase here, SEEDS concludes that very little (about €100bn) of the reported €433bn rise in GDP since 2000 has been sustainable and organic, with the rest being a simple function of the spending of borrowed money. 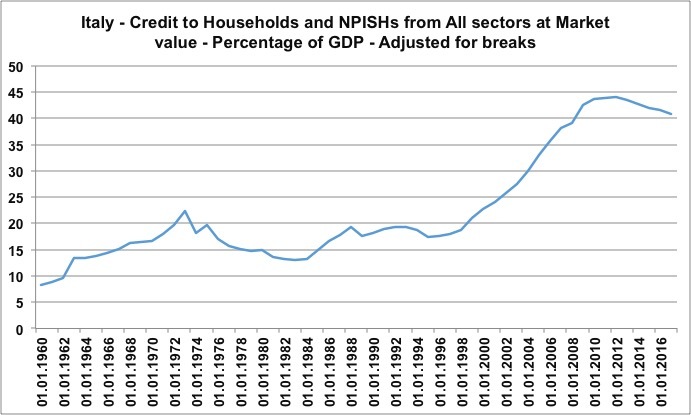 Shorn of this credit effect, underlying or clean GDP per capita is lower now (at €29,550) than it was in 2000 (€30,777). Meanwhile, trend ECoE in France is put at 7.8%. Though by no means the worst amongst comparable economies, this nevertheless represents a relentless increase, rising from 4.6% back in 2000. At the individual or household level, rising ECoE is experienced primarily in higher costs of household essentials. In the aggregate, ECoE acts as an economic rentdeduction from clean GDP. Between 2000 and 2017, clean GDP itself increased by only 5.7%, and the rise in ECoE left French aggregate prosperity only marginally (2.2%) higher in 2017 than it was back in 2000. Over that same period, population numbers increased by 10%, meaning that prosperity per person is 7.1% lowernow than it was at the millennium. In France, as elsewhere, the use of credit and monetary adventurism in an effort to deliver “growth” has added markedly to the aggregate debt burden, which is €3.1tn (86%) higher now than it was in 2000. The per capita equivalent has climbed by 69%, making the average person €41,800 (69%) more indebted than he or she was back in 2000. To summarise, then, we can state the economic circumstances of the average French citizen as follows. First, and despite a rise in official GDP per capita, his or her personal prosperity is 7.1% (€2,095) lower now than it was as long ago as 2000. Second, he or she has per capita debt of €102,200, up from €60,400 back in 2000. Third, the deterioration in prosperity has been experienced most obviously in costs of household essentials, which have outpaced both wages and headline CPI inflation over an extended period. This is the context in which we need to place changes in the workplace, and a perceived widening in inequality. On this latter point, part of the explanation for the anger manifested in France can be grasped from this chart, published by the Institut des Politiques Publiques. In the current budget, policy changes hurt the disposable incomes of the poorest 10% or so (on the left of the scale), but ought to be welcomed by most of the rest – and perhaps might be, were it not for the huge handouts seemingly being given to the very wealthiest. Moreover, these benefits aren’t being conferred on a large swathe of “the rich”, but accrue only to the wealthiest percentile. This is part of a pattern visible throughout much of the West. Unfortunately, perceptions of hand-outs to a tiny minority of the super-rich have arisen in tandem with a deteriorating sense of security. Security is a multi-faceted concept, which extends beyond security of employment to embrace prosperity, wages, living costs and public services. Even in the euphoric period immediately following his election, it seemed surprising that French voters would back as president a man committed to ‘reform’ of French labour laws, a process likely to reduce workers’ security of employment. Add in further deterioration in prosperity, and an apparent favouring of the super-rich, and the ingredients for disaffection become pretty obvious. The interpretation set out here strongly indicates that protests are unlikely to die down just because the government has made some concessions over fuel taxes – the ‘gilet jaunes’ movement might have found its catalyst in diesel prices, but now embraces much wider sources of discontent. Given the context of deteriorating prosperity, it’s hard to see how the government can respond effectively. Even the imposition of swingeing new taxes on the super-rich – a wildly unlikely initiative in any case – might not suffice to assuage popular anger. It seems likelier that the authorities will ramp up law enforcement efforts in a bid to portray the demonstrators as extremists. The scale of apparent support for the movement – if not for some of its wilder excesses – suggests that such an approach is unlikely to succeed. Of course, it cannot be stressed too strongly that the French predicament is by no means unique. Deteriorating prosperity, a sense of reduced security and resentment about the perceived favouring of the super-rich are pan-European trends. In the longer term, trends both in prosperity and in politics suggest that the West’s incumbent elites are fighting a rear-guard action. The credibility of their market economics mantra suffered severe damage in 2008, when market forces were not allowed to run to their logical conclusions, the result being a widespread perception that the authorities responded to the global financial crisis with rescues for “the rich” and “austerity” for everyone else. This problem is exacerbated by the quirks of the euro system. In times past, a country like Italy would have responded to hardship by devaluation, which would have protected employment at the cost of gradual increases in the cost of living. Denied this option, weaker Euro Area countries – meaning most of them – have been forced into a process of internal devaluation, which in practice means reducing costs (and, principally, wages) in a way popularly labelled “austerity”. The combination of a single monetary policy with a multiplicity of sovereign budget processes was always an exercise in economic illiteracy, and the lack of automatic stabilisers within the euro system is a further grave disadvantage. Finally, the challenge posed by deteriorating prosperity is made much worse by governments’ lack of understanding of what is really happening to the economy. If you were to believe that rising GDP per capita equates to improving prosperity – and if you further believed that ultra-low rates mean that elevated debt is nothing to worry about – you might really fail to understand what millions of ordinary people are so upset about. After all, as somebody might once have said, they can always eat brioche. Very few people join all the dots, and as usual, Gail Tverberg does her best to do so here again…. There are so many signals on the web now pointing to a major reset it’s not funny. Many people, including most Peak Oilers, expect that oil prices will rise endlessly. They expect rising oil prices because, over time, companies find it necessary to access more difficult-to-extract oil. Accessing such oil tends to be increasingly expensive because it tends to require the use of greater quantities of resources and more advanced technology. This issue is sometimes referred to as diminishing returns. Figure 1 shows how oil prices might be expected to rise, if the higher costs encountered as a result of diminishing returns can be fully recovered from the ultimate customers of this oil. In my view, this analysis suggesting ever-rising prices is incomplete. After a point, prices can’t really keep up with rising costs because the wages of many workers lag behind the growing cost of extraction. The economy is a networked system facing many pressures, including a growing level of debt and the rising use of technology. 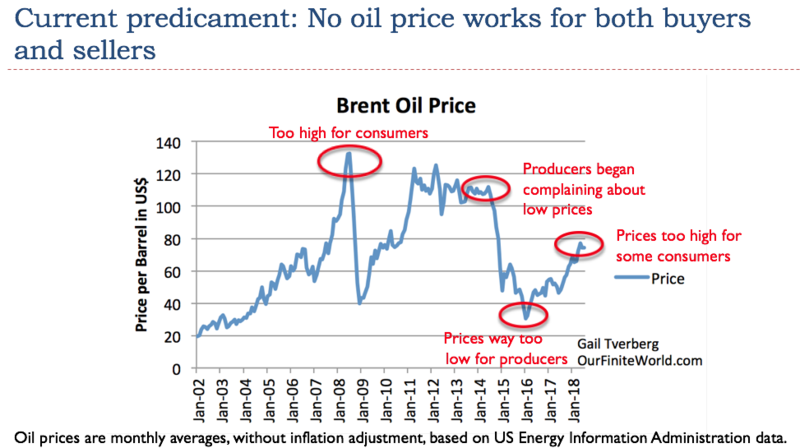 When these pressures are considered, my analysis indicates that oil prices may fall too low for producers, rather than rise too high for consumers. Oil companies may close down if prices remain too low. Because of this, low oil prices should be of just as much concern as high oil prices. In recent years, we have heard a great deal about the possibility of Peak Oil, including high oil prices. If the issue we are facing is really prices that are too low for producers, then there seems to be the possibility of a different limits issue, called Collapse. Many early economies seem to have collapsed as they reached resource limits. Collapse seems to be characterized by growing wealth disparity, inadequate wages for non-elite workers, failing governments, debt defaults, resource wars, and epidemics. Eventually, population associated with collapsed economies may fall very low or completely disappear. As Collapse approaches, commodity prices seem to be low, rather than high. The low oil prices we have been seeing recently fit in disturbingly well with the hypothesis that the world economy is reaching affordability limits for a wide range of commodities, nearly all of which are subject to diminishing returns. This is a different problem than most researchers have been concerned about. In this article, I explain this situation further. One thing that is a little confusing is the relative roles of diminishing returns and efficiency. I see diminishing returns as being more or less the opposite of growing efficiency. 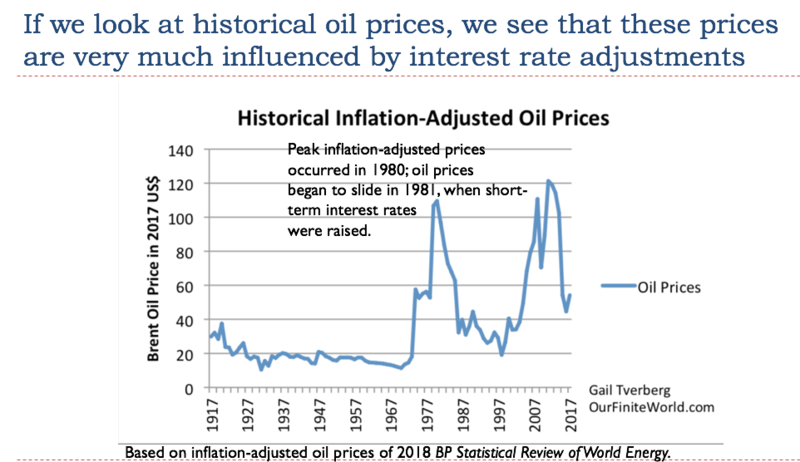 The fact that inflation-adjusted oil prices are now much higher than they were in the 1940s to 1960s is a sign that for oil, the contest between diminishing returns and efficiency has basically been won by diminishing returns for over 40 years. It makes no sense for oil prices to rise endlessly, for what is inherently growing inefficiency. Endlessly rising prices for oil would be similar to paying a human laborer more and more for building widgets, during a time that that laborer becomes increasingly disabled. If the number of widgets that the worker can produce in one hour decreases by 50%, logically that worker’s wages should fall by 50%, not rise to make up for his/her growing inefficiency. The problem with paying higher prices for what is equivalent to growing inefficiency can be hidden for a while, if the economy is growing rapidly enough. The way that the growing inefficiency is hidden is by adding Debt and Complexity (Figure 4). Growing complexity is very closely related to “Technology will save us.” Growing complexity involves the use of more advanced machinery and ever-more specialized workers. Businesses become larger and more hierarchical. International trade becomes increasingly important. Financial products such as derivatives become common. Growing debt goes hand in hand with growing complexity. Businesses need growing debt to support capital expenditures for their new technology. Consumers find growing debt helpful in affording major purchases, such as homes and vehicles. Governments make debt-like promises of pensions to citizen. Thanks to these promised pensions, families can have fewer children and devote fewer years to child care at home. The problem with adding complexity and adding debt is that they, too, reach diminishing returns. The easiest (and cheapest) fixes tend to be added first. For example, irrigating a field in a dry area may be an easy and cheap way to fix a problem with inadequate food supply. There may be other approaches that could be used as well, such as breeding crops that do well with little rainfall, but the payback on this investment may be smaller and later. A major drawback of adding complexity is that doing so tends to increase wage and wealth disparity. When an employer pays high wages to supervisory workers and highly skilled workers, this leaves fewer funds with which to pay less skilled workers. Furthermore, the huge amount of capital goods required in this more complex economy tends to disproportionately benefit workers who are already highly paid. This happens because the owners of shares of stock in companies tend to overlap with employees who are already highly paid. Low paid employees can’t afford such purchases. The net result of greater wage and wealth disparity is that it becomes increasingly difficult to keep prices high enough for oil producers. The many workers with low wages find it difficult to afford homes and families of their own. Their low purchasing power tends to hold down prices of commodities of all kinds. The higher wages of the highly trained and supervisory staff don’t make up for the shortfall in commodity demand because these highly paid workers spend their wages differently. They tend to spend proportionately more on services rather than on commodity-intensive goods. For example, they may send their children to elite colleges and pay for tax avoidance services. These services use relatively little in the way of commodities. A growing economy can hide a multitude of problems. 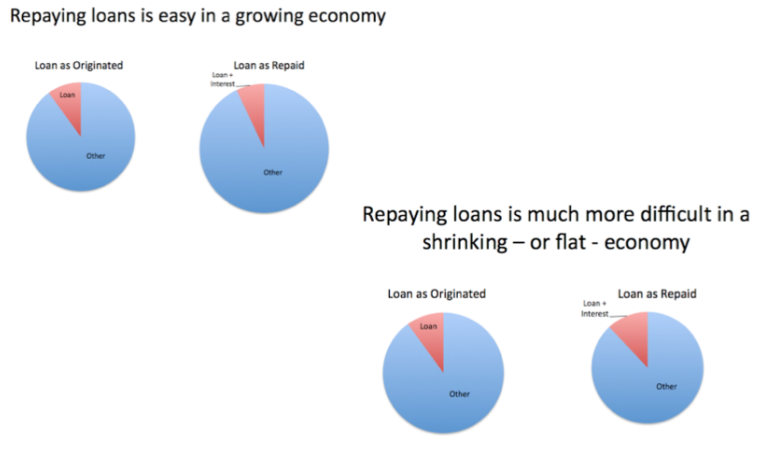 Paying back debt with interest is easy, if a worker finds his wages growing. In fact, it doesn’t matter if the growth that supports his growing wages comes from inflationary growth or “real” growth, since debt repayment is typically not adjusted for inflation. Both real growth and inflationary growth help workers have enough funds left at the end of the period for other goods they need, despite repaying debt with interest. Once the economy stops growing, the whole system tends to implode. Wage disparity becomes a huge problem. It becomes impossible to repay debt with interest. Young people find that their standards of living are lower than those of their parents. Investments do not appear to be worthwhile without government subsidies. Businesses find that economies of scale no longer work to their advantage. Pension promises become overwhelming, compared to the wages of young people. 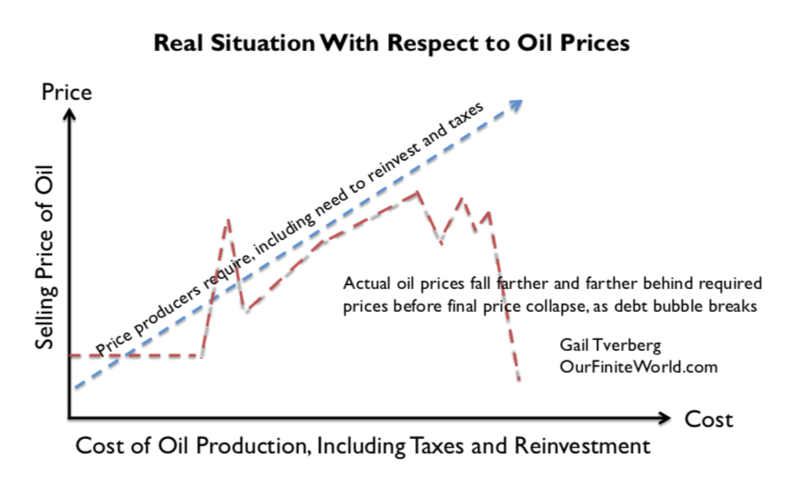 The real situation with oil prices–and in fact with respect to commodity prices in general–is approximately like that shown in Figure 6. What tends to happen is that oil prices tend to fall farther and farther behind what producers require, if they are truly to make adequate reinvestment in new fields and also pay high taxes to their governments. This should not be too surprising because oil prices represent a compromise between what citizens can afford and what producers require. In the years before diminishing returns became too much of a problem (back before 2005, for example), it was possible to find prices that were within an acceptable range for both sellers and buyers. As diminishing returns has become an increasing problem, the price that consumers can afford has tended to fall increasingly far below the price that producers require. This is why oil prices at first fall a little too low for producers, and eventually seem likely to fall far below what producers need to stay in business. The problem is that no price works for both producers and consumers. We are dealing with a situation in which a growing share of workers (and would be workers) find it difficult to afford a home and family, because of wage disparity issues. Some workers have been displaced from their jobs by robots or by globalization. Some spend many years in advanced schooling and are left with large amounts of debt, making it difficult to afford a home, a family, and other things that many in the older generation were able to take for granted. Many of today’s workers are in low-wage countries; they cannot afford very much of the output of the world economy. 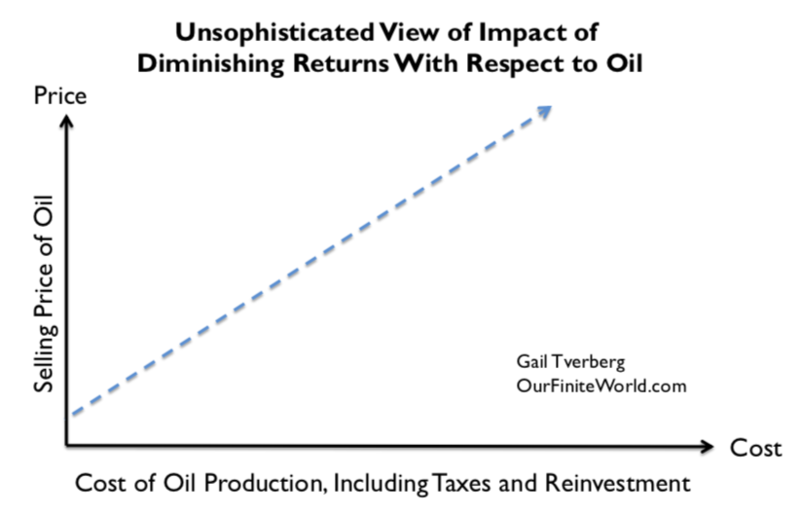 At the same time, diminishing returns affect nearly all commodities, just as they affect oil. Mineral ores are affected by diminishing returns because the highest grade ores tend to be extracted first. Food production is also subject to diminishing returns because population keeps rising, but arable land does not. As a result, each year it is necessary to grow more food per arable acre, leading to a need for more complexity (more irrigation or more fertilizer, or better hybrid seed), often at higher cost. When the problem of growing wage disparity is matched up with the problem of diminishing returns for the many different types of commodity production, the same problem occurs that occurs with oil. Prices of a wide range of commodities tend to fall below the cost of production–first by a little and, if the debt bubble pops, by a whole lot. We hear people say, “Of course oil prices will rise. Oil is a necessity.” The thing that they don’t realize is that the problem affects a much bigger “package” of commodities than just oil prices. In fact, finished goods and services of all kinds made with these commodities are also affected, including new homes and vehicles. Thus, the pattern we see of low oil prices, relative to what is required for true profitability, is really an extremely widespread problem. Commodity prices bear surprisingly little relationship to the cost of production. Instead, they seem to depend more on interest rate policies of government agencies. If interest rates rise or fall, this tends to have a big impact on household budgets, because monthly auto payments and home payments depend on interest rates. For example, US interest rates spiked in 1981. This spike in interest rates led to a major cutback in energy consumption and in GDP growth. Oil prices began to slide, with the higher interest rates. 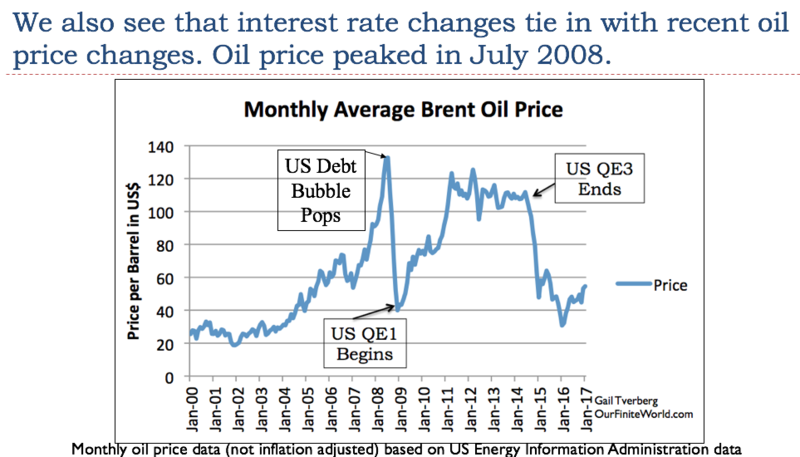 Figure 11 indicates that the popping of a debt bubble (mostly relating to US sub-prime housing) sent oil prices down in 2008. Once interest rates were lowered through the US adoption of Quantitative Easing (QE), oil prices rose again. They fell again, when the US discontinued QE. While these charts show oil prices, there is a tendency for a broad range of commodity prices to move more or less together. This happens because the commodity price issue seems to be driven to a significant extent by the affordability of finished goods and services, including homes, automobiles, and restaurant food. If the collapse of a major debt bubble occurs again, the world seems likely to experience impacts somewhat similar to those in 2008, depending, of course, on the location(s) and size(s) of the debt bubble(s). A wide variety of commodity prices are likely to fall very low; asset prices may also be affected. This time, however, government organizations seem to have fewer tools for pulling the world economy out of a prolonged slump because interest rates are already very low. Thus, the issues are likely to look more like a widespread economic problem (including far too low commodity prices) than an oil problem. 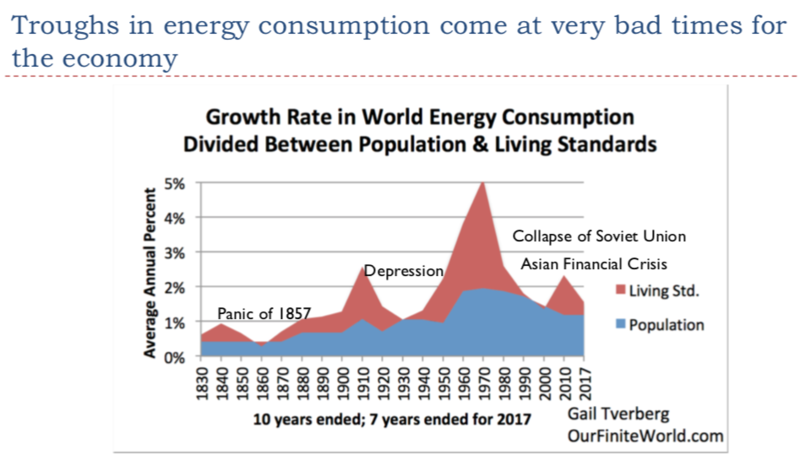 When we look back, the good times from an economic viewpoint occurred when energy consumption per capita (top red parts on Figure 12) were rising rapidly. The bad times for the economy were the valleys in Figure 12. Separate labels for these valleys have been added in Figure 13. 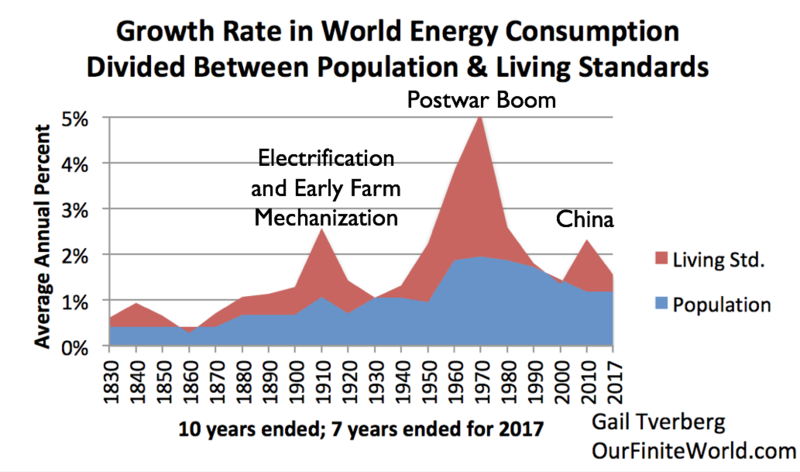 If energy consumption is not growing relative to the rising world population, collapse in at least a part of the world economy tends to occur. The laws of physics tell us that energy consumption is required for movement and for heat. These are the basic processes involved in GDP generation, and in electricity transmission. 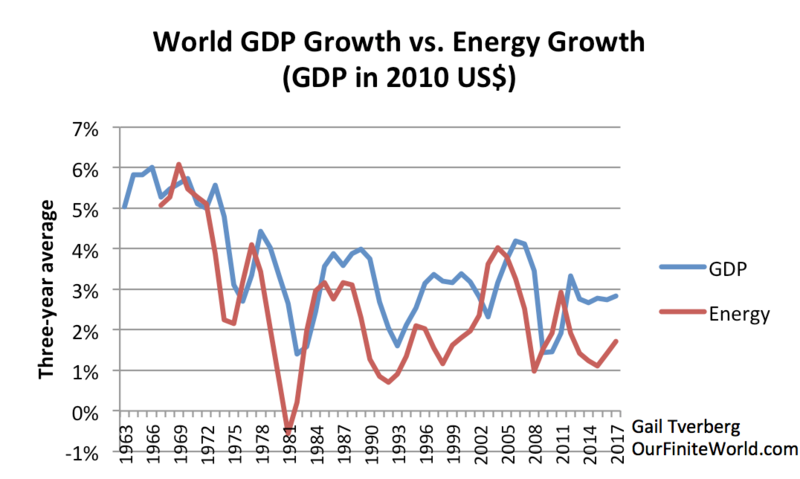 Thus, it is logical to believe that energy consumption is required for GDP growth. 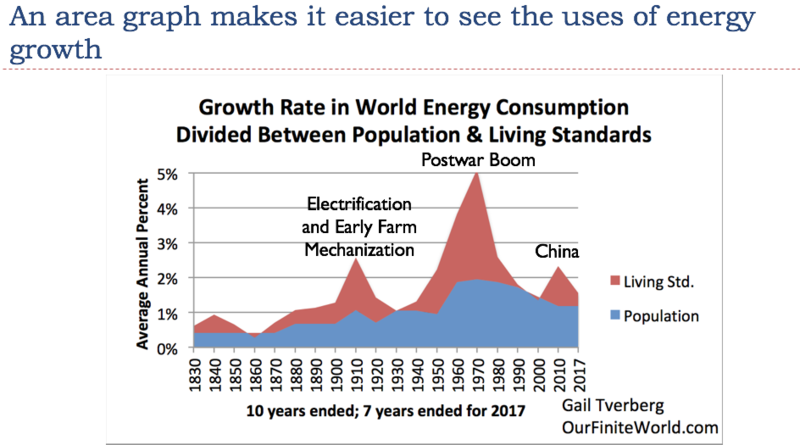 We can see in Figure 9 that growth in energy consumption tends to come before GDP growth, strongly suggesting that it is the cause of GDP growth. This further confirms what the laws of physics tell us. 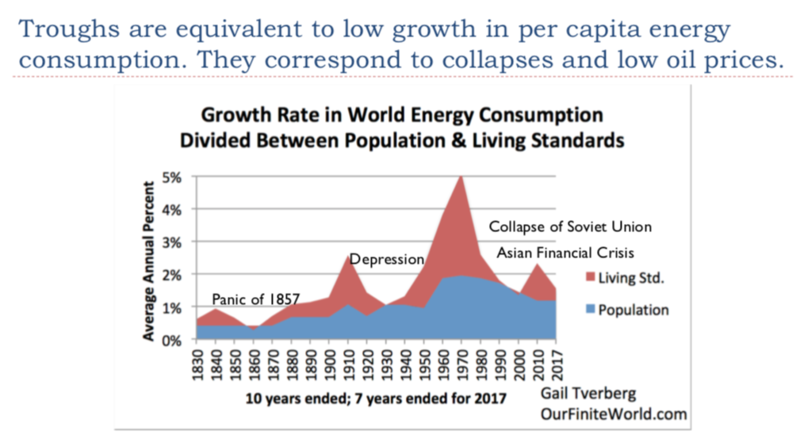 The fact that partial collapses tend to occur when the growth in energy consumption per capita falls too low is further confirmation of the way the economics system really operates. The Panic of 1857occurred when the asset price bubble enabled by the California Gold Rush collapsed. Home, farm, and commodity prices fell very low. The problems ultimately were finally resolved in the US Civil War (1861 to 1865). Similarly, the Depression of the 1930s was preceded by a stock market crash in 1929. During the Great Depression, wage disparity was a major problem. Commodity prices fell very low, as did farm prices. The issues of the Depression were not fully resolved until World War II. At this point, world growth in energy consumption per capita seems to be falling again. We are also starting to see evidence of some of the same problems associated with earlier collapses: growing wage disparity, growing debt bubbles, and increasingly war-like behavior by world leaders. We should be aware that today’s low oil prices, together with these other symptoms of economic distress, may be pointing to yet another collapse scenario on the horizon. In fact, the whole “Peak Oil” story is not really right. Neither is the “Renewables will save us” story, especially if the renewables require subsidies and are not very scalable. Energy prices can never be expected to rise high enough for renewables to become economic. The issues we should truly be concerned about are Collapse, as encountered by many economies previously. If Collapse occurs, it seems likely to cut off production of many commodities, including oil and much of the food supply, indirectly because of low prices. Low oil prices and low prices of other commodities are signs that we truly should be concerned about. Too many people have missed this point. They have been taken in by the false models of economists and by the confusion of Peak Oilers. At this point, we should start considering the very real possibility that our next world problem is likely to be Collapse of at least a portion of the world economy. Interesting times seem to be ahead. Since discovering Jean Marc Jancovici a couple of months ago, I have been following his work, which is mostly in French; but now and again he publishes something in English, so you guys can benefit from reading this while I prepare to drive my wife’s Suzuki Alto with a full load to Tasmania…… yes I am going to get my life back and get to enjoy sharing the fruits of my labour after a three year wait…..
Italy is in trouble. Or more precisely, the country has been “abandonned by growth”. It is one of the few OECD countries that is unable to recover from the “2008 crisis”: its GDP is still lagging below 2007 levels. Would it be the simple result of the unability of the successive governments to make the “appropriate reforms”? It might well be that the explanation lies in something much more different, but much more unpleasant: physics. 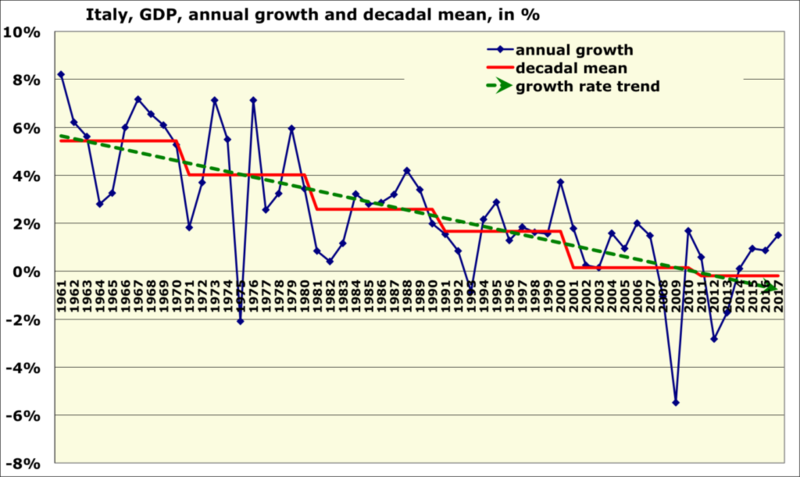 First, statistics are unequivocal on the fact that growth has vanished, so far. Year on year change of the GDP in Italy (or “annual growth rate”) since 1961 (blue curve), average per decade (red curve), and trend on the growth rate (green dotted line). It is easy to see that each decade has been less “successful” than the previous one since the beginning of this series, and that the decade that started in 2010 has an average growth rate which is… negative. Italy has therefore been in recession, “on average”, for the last 7 years. Primary data from World Bank. As the two are generally linked in Western countries, the debt on GDP ratio has risen to heights, botbh for public and private debt. Debt on GDP ratio in Italy since 1995. Primary data from Eurostat. Households debt on GDP ratio since 1960. Data from Bank for International Settlements. 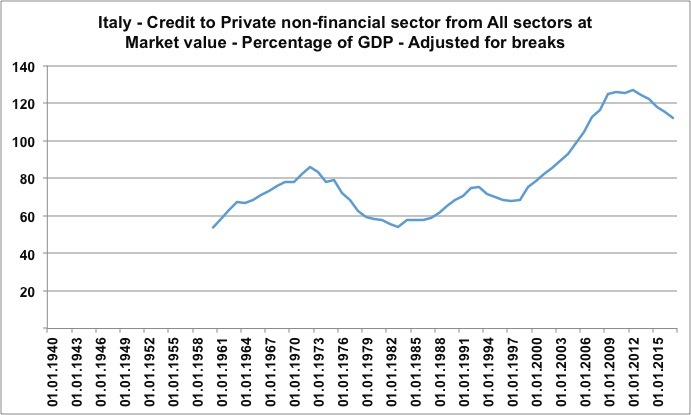 Credit to the non financial sector on GDP ratio (corporates and households) for Italy. Data from Bank for International Settlements. All this would not be so annoying – well, from an economic point of view – if growth were to resume, because then the money to repay all this extra debt would be available. But why doesn’t growth come back? Some say that this is due to the lack of reforms. This is due to the lack of reforms, but not the same (reforms), say others. But what if the true reason is… the lack of energy? In Italy, as elsewhere, the machines that surround us everywhere (rolling mills, chemical plants, trains, fridges, elevators, trucks, cars, planes, stamping presses, drawers, extruders, tractors, pumps, cranes…) have 500 to 1000 times the power of the muscles of the population. It’s these machines that produce, not men. Today, homes, cars, shirts, vacuum cleaners, fridges, chairs, glasses, cups, scissors, shampoo, books, frozen dishes, and all the other tens of thousands of products that you benefit from are produced by machines. If these machines lack energy, they operate less, production decreases, and so does the monetary counterpart of this production, that is the GDP. And it is probably what happened in our southern neighbor. 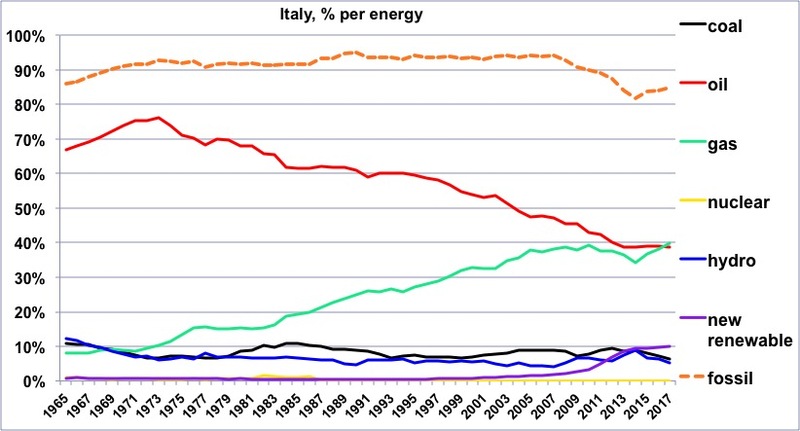 First of all, energy is definitely less abundant in Italy today than it was 10 years ago. Primary energy used in Italy (sometimes called “primary energy consumption”; “primary” refers to the fact that it is the energy extracted from the environment in its raw form – raw coal, crude oil, crude gas, etc, not processed fuels or electricity that come out of the energy industries: refined fuels, electricity, processed gas, etc) since 1965. There was a maximum in 2005, i.e. 3 years before the fall of Lehman Brothers. It is impossible to attribute the decline in consumption to a crisis caused by the bankers’ negligence! It is interesting to note that maximum of the energy consumption in Italy corresponds to the maximum gas production of Algeria (2005), Italy’s second largest gas supplier after Russia. 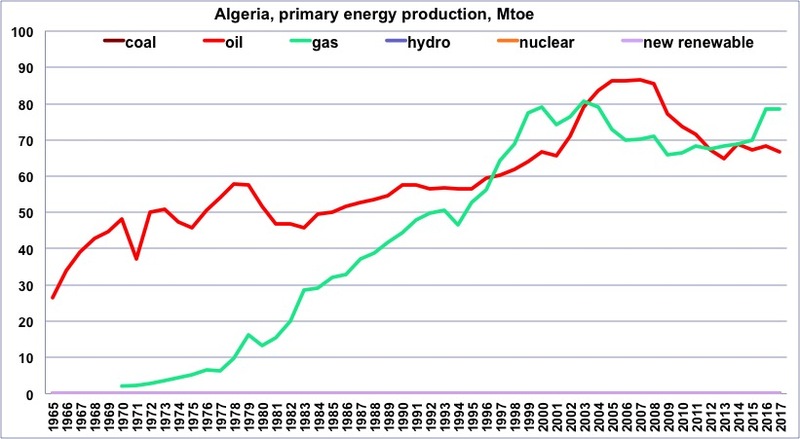 Oil and gas production in Algeria since 1965 (oil) and 1970 (gas). Oil production peaked in 2008, and gas production in 2003 so far (monthly data from the Energy Information Agency suggest that the gas production in Algeria is anew on the decline). Primary data from BP Statistical Review. 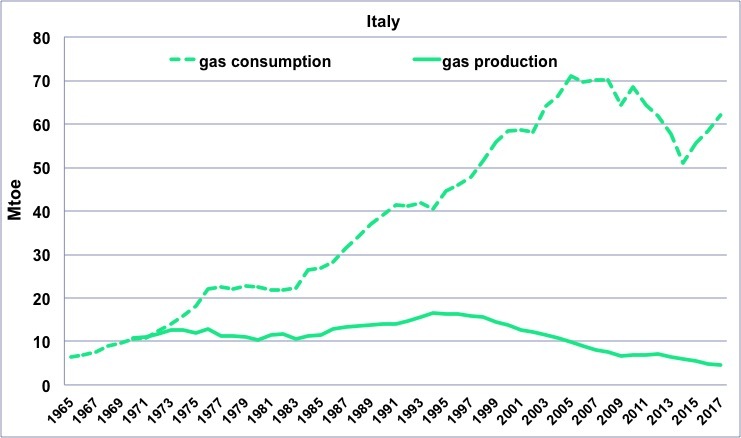 Italy is a major consumer of gas, because its electricity production relies on it for half of the domestic generation. This maximum (of energy consumption in Italy) also corresponds to the beginning of the stabilization of world oil production that took place between 2005 and 2010, which also led to a decrease in Italy’s import capacity in this precious liquid. 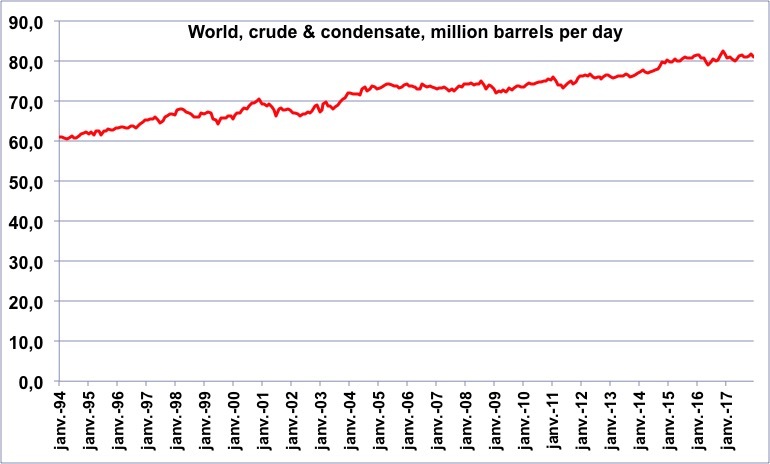 Monthly production of liquids (crude oil and condensates) worldwide. Data from the Energy Information Agency. We can clearly see the “plateau” that runs from 2005 to 2010, before the rise of the American shale oil, which has rekindled global growth and allowed the subsequent economic “rebound”. Combined together, oil and gas accounted for 85% of Italian energy in 2005 (and accounted for 65% of its electricity production): less oil available on the world market (because a constant production must be shared with a growing importation from the emerging countries), and less gas available in Europe and Algeria led to a decline in supply beforethe beginning of the financial crisis. In fact, when looking at trends over long periods, we can see that, in Italy as in all industrialized countries, i. e. with machines that produce instead of men, GDP is driven by available energy. 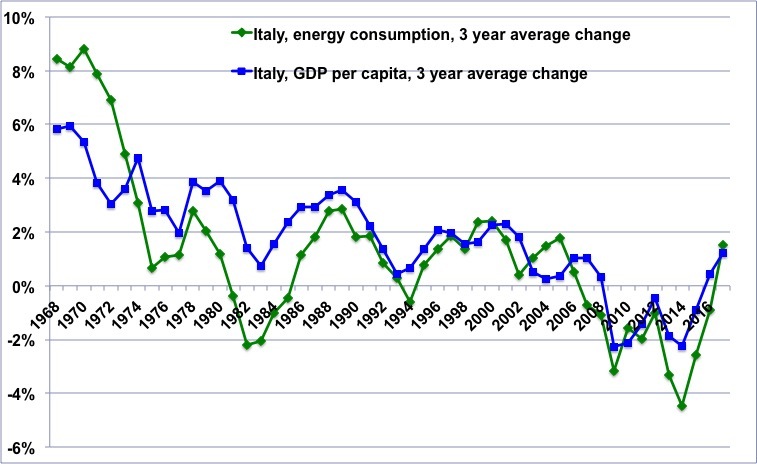 Rate of change (3 year running average) of the energy consumption in Italy (green curve) and rate of change (also 3 year running average) of the Italian GDP. It is noteworthy that the trend is the same for both. Where’s the hen, where’s the egg? For what follows, we just need one valid rule: less energy means less running machines and thus less GDP. And we see that when the energy growth slower, so does the GDP, one to two years later, which supports the idea that when it is energy that is constrained, GDP is forced to be constrained as well. This “precedence” of energy over GDP will show up in another presentation of the same data. We note that the curve makes a series of “turns to the left” in 1974, 1979, and especially from 2005 onwards. The “turn on the left” means that it is first the energy that decreases, and then the GDP, excluding in fact a sequence that would explain the decrease in the energy consumed by the crisis alone (then the curve should “turn right”). One can also notice that after the decline in GDP from 2006 to 2014, the line goes back to “normal”, that is going from “bottom left” to “top right”, which reflects a GDP that grows again because of an energy supply that does the same. Well, for the moment energy supply is going downwards, but will it continue to do so in the future? 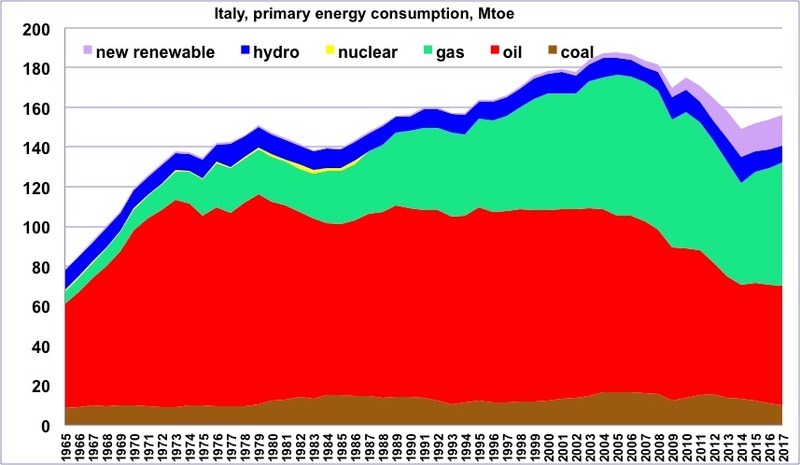 For the first 3 components of the energy supply in Italy, things look pretty settled. For coal, all is imported. This fuel is a nightmare regarding logistics: a 1 GW power plant requires between 4000 and 10000 tonnes of coal per day, and this explains why when a country is not a coal producer its coal imports are never massive. Add on top that coal is clearly the first “climate ennemy” to shoot: calling massively on imported coal to compensate for the decline of the rest seems very unprobable. Consumption (dotted lines) and production (solid line, actually zero all the time!) 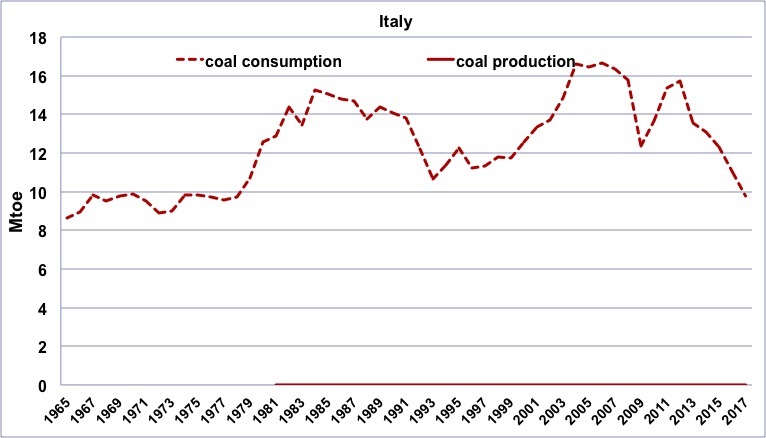 of coal in Italy. Data from BP Statistical Review. Then comes oil. Italy imports almost all it uses, and when world production stopped growing in 2005, Italian consumption fell in a forced way – as in all OECD countries – because the emerging countries took an increasing share. 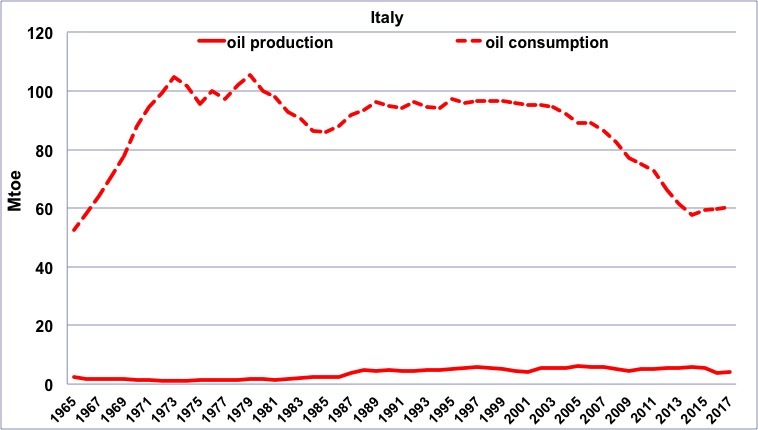 Consumption (dotted lines) and production (solid line) of oil in Italy. Data from BP Statistical Review. Eventually comes gas. 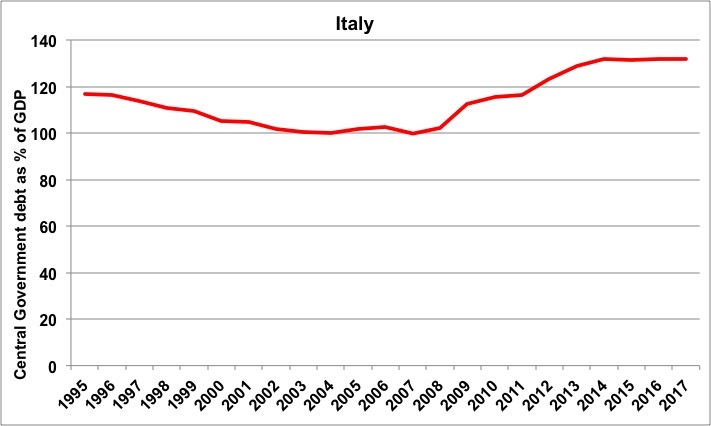 Here too, Italy had to reduce its consumption in a compulsory way after 2005, when Algerian production – which provides about a third of Italian consumption – peaked. Consumption (dotted lines) and production (solid line) of gas in Italy. Data from BP Statistical Review. Italy gave up nuclear power after Chernobyl, and so no “relief” can come from this technology. Hydroelectricity has been at its peak for decades, with all or most of the equippable sites having been equipped. In addition, the drying up of the Mediterranean basin due to climate change should also reduce rather than increase this production. 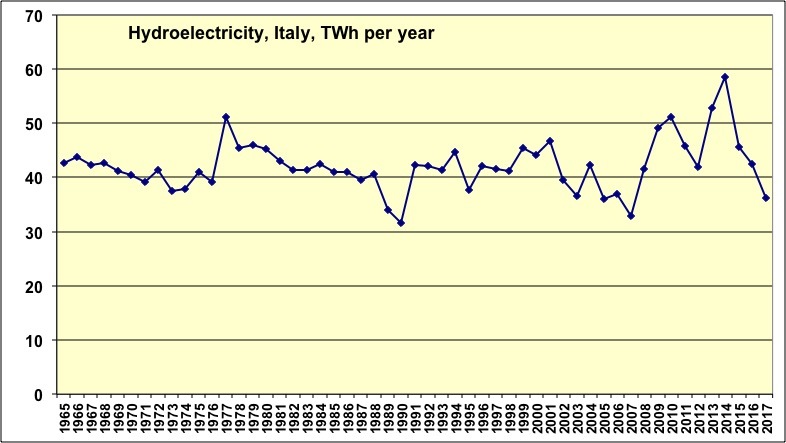 Hydroelectric production in Italy since 1965, in TWh (billion kWh) electricity. Data from BP Statistical Review. Then remain the “new renewable”, mostly solar, biomass and wind energy, that now represent about the equivalent of hydropower. But solar and wind require a lot of capital to be deployed, and thus the irony is that if the economy “suffers” because of a decline in the supply of fossil fuels, there is fewer money to invest in this supply! Biomass requires a lot of land to become significant because of the biomass that has to be grown. 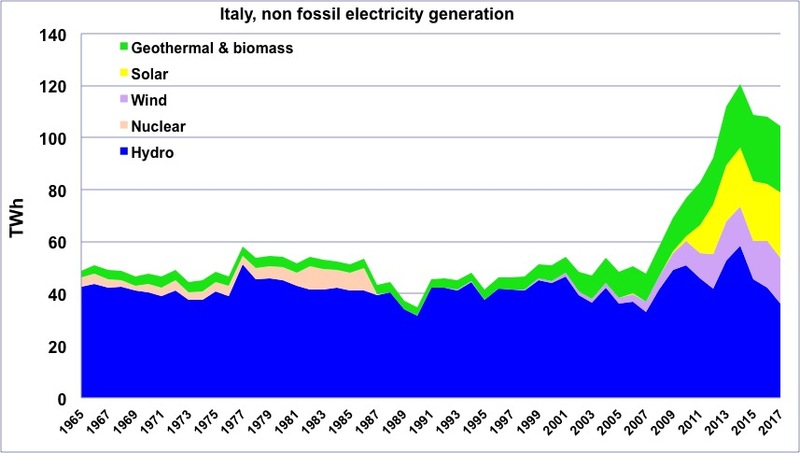 Non-fossil electricity production in Italy since 1965. We see that the “new renewable” (biomass, wind, solar) do a little more than hydroelectricity, i.e. 20% of the total production (of electricity only, of course). Data from BP Statistical Review. As these means cannot quickly supply large extra quantities of electricity, and will quickly be limited by storage issues, the energy used in Italy remains massively fossil, and will do so in the short term. 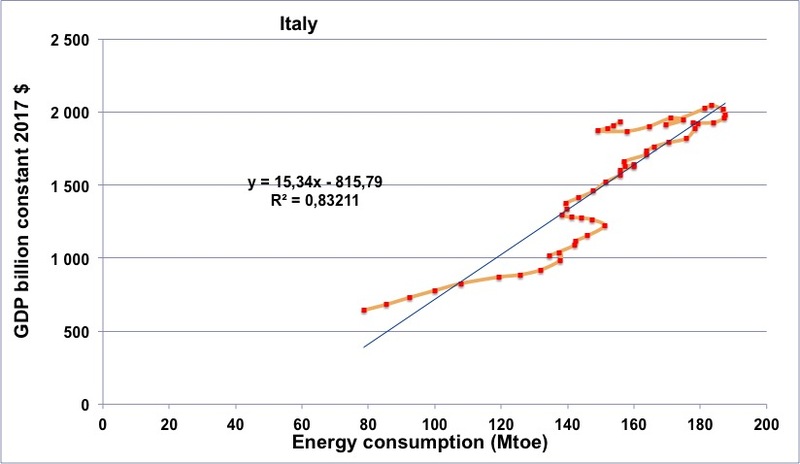 Share of each energy in Italian consumption. Data from BP Statistical Review. It is therefore likely that Italy will remain massively dependent on fossils fuels in the next 10 to 20 years, and since the supply of these fuels is likely to continue to decrease on average, which means that Italy will have to manage its destiny without a return to growth, or even with a structural recession. It is to this conclusion that a “physical” reading of the economy leads. And what is happening to our neighbours to the south is, most probably, the “normal” way in which an industrialized country reacts to the beginning of an unexpected energy contraction (and then populists follow, because of promises that coldn’t be fulfiled). As other European countries do not anticipate any better their upcoming energy contraction (that will happen anyway because oil, gas and coal are not renewable), let us look carefully at what is happening in this country. Something similar is likely to happen in France (and in Europe, and in the OECD) too if we do not seriously address the issue of fossil fuels, or more precisely if we do not seriously begin to organise society with less and less fossil fuels, including if it means less and less GDP. Thanks to good old facebook, I have discovered another webside I want to share with my now nearly 800 followers…. Mansoor Khan is writing a book called The Third Curve, and is publishing it chapter by chapter on his website. I am currently distracted by a wedding and a funeral in Queensland, and haven’t yet delved too far into this book, but I was originally attracted to it by that telling graph at left, because it clearly describes the disconnect between concept and reality…. Khan studied engineering at IIT, Cornell University and MIT but then went on to make four feature films including Qayamat Se Qayamat Tak and Jo Jeeta Wohi Sikander. In 2003, he moved to Coonoor, to realize his first passion of living on an organic farm. His first book, ‘The Third Curve – The End of Growth as we know it’ explains the limits of growth in economy and industry from an Energetics perspective. 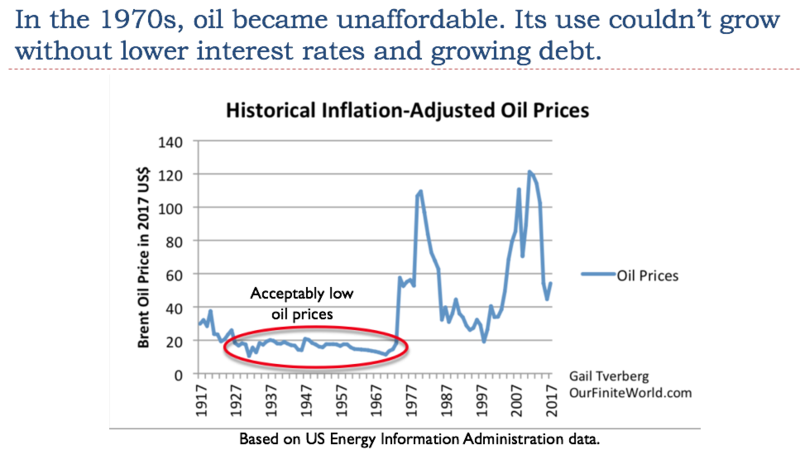 Gail Tverberg, and others, have been saying for some time now, that the disconnect occurred during the 1970’s and 1980’s oil shocks, when the amount of net energy available from conventional oil (there was nothing else that far back) started going down. It was also the time when Thatcher and Reagan had to choose between managing limits to growth, or deregulating everything and, as Thatcher put it, move from a society to an economy. Of course the former never had a chance in hell of being applied, so now we are stuck with this neoliberalism cancer that will destroy civilisation……. Debt has clearly replaced net energy to keep growth going until it can’t – like round about right now – and surely collapse can no longer be very far away……. Mnsoor Khan calls it deficit in real growth. To most, the Modern Industrial World is the epitome of man’s ingenuity: a glorious manifestation of human intelligence and enterprise. In my opinion, this is completely untrue. The fact is that all the seemingly fabulous constructs and conveniences of the Modern Industrial World were only possible because of abundant and cheap fossil fuels. Human ingenuity was a co-factor and not the prime reason for it. As simple as that! With a wild Concept like “Time-Value of Money” floating on the edge of our consciousness, we were simply looking for the perfect ally from Reality to make Exponential Growth possible. And we found that ally. It was Oil – nothing but over 150 million years of ancient sunlight trapped in the bosom of the Earth. A once-in-an-eternity bounty. Plentiful, cheap, energy-dense, portable, easily convertible to heat, motion, and electricity… A primeval elixir so varied in possibilities, having the unique innate ability to morph into a dazzling array of useful materials that it, but naturally, shaped the most powerful culture ever to dominate this Earth: modern industrial civilization. No wonder oil has been referred to as the “blood of the devil”, a double-edged warning! With the discovery of oil, the Concept and the Reality fused effortlessly and we took the easiest path. Whatever oil offered us, we seized: cars, airplanes, plastics, lubricants, complex electronics, computers, space travel, internet, gigabyte memory chips, mobile networks, artificial limbs, mega cities, automated garbage collection, robot-controlled assembly lines, global food networks, moving mountains or damming rivers, clearing forests or strip mining! Anything seemed possible! Nothing else could have achieved it on this scale of size, speed and complexity. Yes, oil allowed us to nurture the most audacious, wasteful, self-indulgent and even self-destructive ideas we could dream about, and turn them into reality. This led the civilized world to believe that we did all this because of our superior intelligence as a species and as a culture. We patted ourselves on the back by terming it innate “human ingenuity”. We felt that, even if oil was removed or reduced, we could simply replace it with some other form of energy and continue on the same trajectory. This we also deemed to be our entitlement and inevitable destiny. Shoot the messenger but the message remains. This is a pipe-dream. Few ponder on why this is so. It is because oil was not only an unbelievably cheap, plentiful, dense and portable source of energy to RUN our world, but also a divinely unique source of mind-boggling byproducts that BUILT our Modern Industrial World. Bitumen for our roads, plastics for everything, lubricants for all kinds of machinery, fertilizers and pesticides for our complex and vulnerable modern food production, chemical reagents for pharmaceuticals and endlessly more. All these and more are intertwined in a complex web of interdependencies that are hard to unravel, let alone replace, to make the Modern Industrial World possible. And reaching the peak of oil production means only an imminent decline of what is possible. The world will not disappear because of Peak Oil but we will find ourselves in a considerably different world with a new set of economic rules, in fact, an inversion of the rules of Economics: Shrinkage instead of Growth. 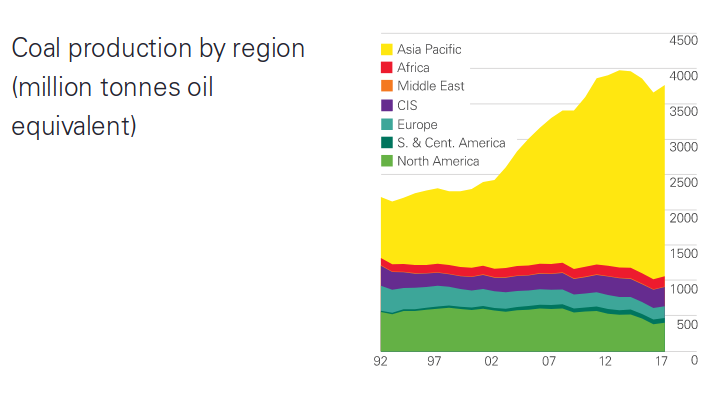 To appreciate fully what oil means, we first have to do a primer on energy. The third curve is worth visiting just for the cartoons!